MI’s famed car critic presents a preview of the first batch of new cars released for publication. Don’t miss the December Ml for a look at more makes and models. All Chrysler cars this year will feature 12-volt electrical systems. The PowerFlite transmission on all of the – Chryslers, which last year featured a shift lever on the dashboard, now is operated by pushbuttons, also on the dash. The big car of the CHRYSLER division, the New Yorker, has upped the displacement from 331 cubic inches to 354. The smaller Windsor has the 331-cubic-inch engine the New Yorker and the Imperial used until now. The compression ratio of the smaller engine has been raised to 8.5 to 1 from 8 to 1 and the compression ration of the bigger engine is a straight 9 to 1. The Chrysler looks have been altered some- what—in fact, quite somewhat. The front end now seems to be thicker from bumper bottom to hood top and the tail fender line has a slight pigeon-tail upswing. These new Chrysler cars, which belted the Top Two around pretty hard in ’55, will undoubtedly continue their sales trend upward, as they are quality buckets from the bolts that hold on the rear bumper to the bugs that collect in the grille. DE SOTO for 1956 has been given the wide-tail treatment, some chrome juggling and sharper all-around good looks than it had in 1955. The big news at De Soto is an increase in engine size from 291 cubic inches to 330, which makes it just one cubic inch smaller than the famous Chrysler engines Briggs Cunningham used at Le Mans so many times and which powered the ’55 Chrysler 300. In 1955 De Soto was the Under-300-Cubic-Inch champion for stock cars at Daytona Beach when it averaged 112 mph. With this new tail-twister it should prove quite a performing car and I hope to bring you a real test of it before long. One novelty which De Soto introduces this season is in the tail fin department. The ’56 cars have enormous fins and from each of them sprouts not one nor two but three lights, including a white back-up light. DODGE for ’56 has the so-called barracuda profile with a mermaid tail-line that starts at the doors and gives the appearance of gently sweeping upward. Through the aid of chrome strips this is accentuated so that at a quick glance the new car closely resembles a guided missile. The new Super Red Ram engine has been enlarged to 315 cubic inches while the plain Red Ram is being kept at 270 cubic inches, the same as in ’55. I have owned a ’55 Dodge station wagon since they first came out. I never fully appreciated it until Hurricane Diane (which was rated “unimportant” by the U. S. Weather Bureau) disagreed with the learned weather forecasters and sloshed us with the biggest flood ever experienced in the East. I was in Philadelphia that night and headed for home when all hell broke loose. It took me six hours to make the 50-mile trip. Much of the time I was driving in two feet of water. If Bill Newberg, Dodge’s prexy, had been building boats instead of automobiles, he couldn’t have done a better job. The Dodge was as dry as a W.C.T.U. convention. Brother, how I thanked those ignition drown-out tests they run at the Chrysler proving grounds. More water got in my en- gine room that night than you’ll find in the average Hollywood swimming pool—but the Dodge never missed a beat. Last year’s Dodge cars were considered by many to be the looks king of the road. In ’56 they look even better. Speaking of looks, I rated last year’s Chrysler 300 the finest-looking car in America, bar none, though the IMPERIAL got the nod as the deluxe king of the entire Chrysler line. The Imperial is a lush wagon of great comfort and ability that packs enough horsepower to fell the Super Chief with one blow. Price-wise, the Imperial is the top layer of the sandwich that encloses the 300 between it and the New Yorker. 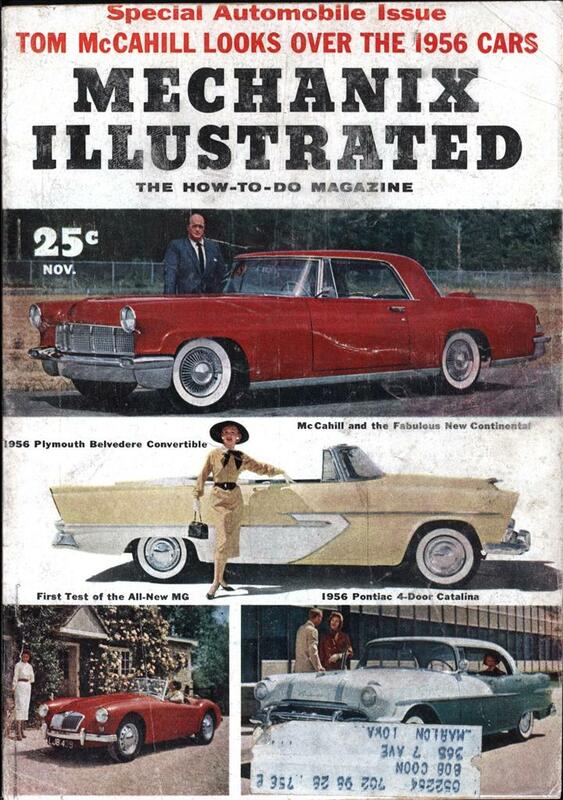 The ’56 Imperial boasts a revised Hotchkiss drive for better handling and cornering. The rear fenders have been swept up and that distinguishing and (to me) silly taillight still remains. The wheelbase has been increased three inches and the overall length has gone up five and a half. Chrysler claims the new Imperial is now more than 20 feet long. This is not an improvement in my book. But it’s a fine car nevertheless. .
Like the New Yorker, the Imperial has had its displacement upped from 331 to 354 cubic inches and now has a potent 9 to 1 compression ratio. I IKE all other Chrysler products, PLYMOUTH, the breadwinner of the family, has beefed up the engine room by adding more cubic-inch displacement for ’56. From 260 the new Plymouth mill goes to 276 cubic inches, four more than the Red Ram engine which powers my ’55 Dodge station wagon. Seeing the writing on the wall, in the form of what its two closest competitors did last year when they stuffed more muscles under the hood, the Plymouth brass has decided to make a pitch for the performance market. Though I haven’t tested the car as yet, with this new engine it should be a well-qualified bomb. Also like the big Chryslers, Plymouth will feature a dashboard-located pushbutton gadget for operating the Power-Flite transmission. In 1955, Plymouth made a big thing of the fact that it was longer than either of the other two cars in its price class. The trend continues. This year’s overall length has been increased by one inch, while height and width remain the same. In looks the main change has been adding fins to the rear fenders. A 12-volt electrical system and a newly-designed safe-lock door latch to keep the doors from flying open on uninvited impact with stone walls and similar objects, are other new features for 1956. THE Ford Motor Company, under the guidance of Henry Ford II and employing enough engineering and design shock troops to man a banana republic army, shows signs of bearing down on the competition in ’56 with more vim and vigor than ever before. Never have the Boys From Dearborn had as much or as potent ammunition as they have arrayed for the coming sales battles. The king of the Ford line is the hew CONTINENTAL, the first really high-class-all-the-way-through car built in America in many years. If you have wondered what happened to all the real chrome they used to put on automobiles, it’s back. The sparse quantities used on this car are the first to come out of Michigan since Governor Soapy Williams’ grandfather started shaving. Without the aid of phony geegaws or Coney Island tinsel, Bill Ford’s Continental Division has fielded a truly great car. The Continental, which looks to me like a big, fully-deluxed, four-passenger Thunderbird, should fulfill the fondest hopes of the “Why don’t they bring back the old Continental?” set. The Continental is powered by a huge, 368-cubic-inch engine reputed to put out 400 foot-pounds of torque. According to Ford’s abacus-manipulators, this powerhouse develops 285 hp. Basically, the engine is the same one used in the ’56 Lincoln. Then what makes the Continental such a choice item? The refinements in upholstery, the magnificent paint job and the discreet use of real-McCoy chrome all smack of quality that left our home scene the last time Buffalo Bill and Annie Oakley vied for shooting-iron credits at the old Madison Square Garden. This is for the guy who wants the best. It will stand out from the other cars in a parking lot like Prince Valiant on his white charger surrounded by street hooligans dressed in space helmets and zoot suits. The ’56 FORD, which I test on pages 92-95 of this issue, once again is available in many flavors, shapes and sizes. As this picture and those elsewhere in the magazine show, styling changes have not been very drastic. The big deal for those who like real gutty performance is the new Fair-lane series, which has last year’s Thunderbird engine brought up to date. This is quite a package. It will enable you to turn 0-60 in 11.8 seconds, or maybe even a little faster. POWERED by the same 285-horsepower engine used in the Continental, the 1956 LINCOLN has been stretched in length and width to please the most sensitive lower-back area of the country’s most critical dowager duchesses. This has been done without losing the old road feel of the past. It is not the way I like my Lincolns but the new cars will have twice the appeal, for twice as many people, as ever before, which is what counts when a company is making bank deposits. With its huge new engine, the ’56 Lincoln gets down the road in well under 12 seconds for 0-60, while affording all the drawing room comfort of a swanky gin mill. It is obvious that Lincoln is going after the big car trade with a really big car. Overall length has been increased seven inches and is now a little over 18-1/2 feet. Yet the car corners better than last year’s model and will do an honest 112 mph. As I pointed out in last month’s road-test report, the new Lincoln will “out-fanny any car on the block.” To accomplish this while creating a Gargantua eligible to compete in anybody’s Biggest Car Contest, was no mean feat of engineering and I tip my hat to Lincoln’s slide-rule jockeys. The ’56 cars of course offer the same safety features of the rest of the Ford line, including optional safety belts. MERCURY for 1956 is the hot-shot wildcat of the Ford line. It is now powered by a 312-cubic-inch engine that can whip it away from traffic lights like a gazelle and has a top speed of close to 110, even with MercOMatic transmission. The body shell and interiors are similar to the ’53 and ’54 Lincolns, brought up to date with wrap-around windshield, tubeless tires, 12-volt system and—like all Ford Motor Company products this year—a five-part package of safety devices aimed at reducing passenger injuries in case of accident. This includes a deep-center steering wheel which gives way slowly on impact, optional seat belts for front and back seats, safety door latches, safety rear-view mirrors with a special backing to discourage the glass from popping out, and crash cushioning for the instrument panel and sun visors. Based on previous records, I think that percentage-wise the ’56 Mercury will be Ford’s selling star. They are sensibly-sized cars, the way I like them—big enough but not too big—and with all the performance anyone could want. The Mercury has looks, comfort and handles like a competition Mexican Lincoln. It’s my bet that the public will go for it like an Irishman after a slab of corned beef. ONLY two of the five General Motors cars have been officially announced at this date but let’s take a look at them. First, Congratulations to CADILLAC! The 1956 Caddies are from two-and-a-half to five inches shorter than they were in 1955! This is a real advancement toward safety through better handling. While Cadillac’s competitors— who have been copying them for so many years—continue on a glandular spree, bragging about their tremendous size increases for next year, the car that started the how-long-can-you-make-’em? craze has made a complete turnabout. In addition to this smartest of smart moves, Cadillac claims 285 horsepower for its all-new regular engine and 305 hp for the Eldorado series, both of which displace 365 cubic inches and have a 9.75 to 1 compression ratio. Cadillac now boasts an 18-inch-wide brake pedal, power brakes as standard equipment and a tricky outside mirror that can be adjusted from inside the car. The familiar egg crate grille has been rejiggered, the headlights re-shaped, the bumper guards (or Dagmars) blunted, and the side panels re-worked. The HydraMatic transmission has been improved, they say. 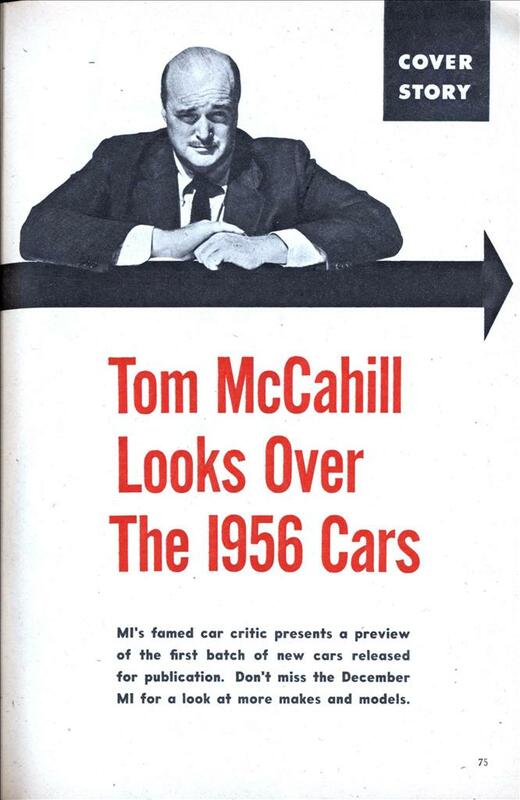 This sums up Cadillac for ’56. THE 1956 PONTIAC line is topped by a big 316.6-cubic-inch, 227-horsepower V8 engine equipped with a four-barrel carburetor, which powers the new Star Chiefs. The smaller Pontiacs have a 202-hp mill with a two-barrel carburetor. You can still buy a Pontiac with a synchromesh transmission, instead of Hydramatic, but the gearstick jobs are penalized at the factory by lower compression engines. The big StratoStreak engine, with its 8.9 to 1 compression ratio, should really whip these feather boas down the road like Halley’s comet. This year Pontiac also has a four-door hardtop (shown above), a model which promises to replace the old sedan design in all makes within the next two or three years. The chrome treatment has been somewhat conservatized for ’56, though the double-breasted stripes are still on the hood. I have always felt that over-chroming the Pontiac, one of the best-looking cars on the road, was comparable to putting polka-dot lipstick on a glamor girl. This Pontiac, GM’s pitch to the middle-income group, is a sturdy, well-built automobile loaded with comfort features for a coast-to-coast junket or a fast trip to the beer hall. These are good cars and should appeal to all Pontiac fans.